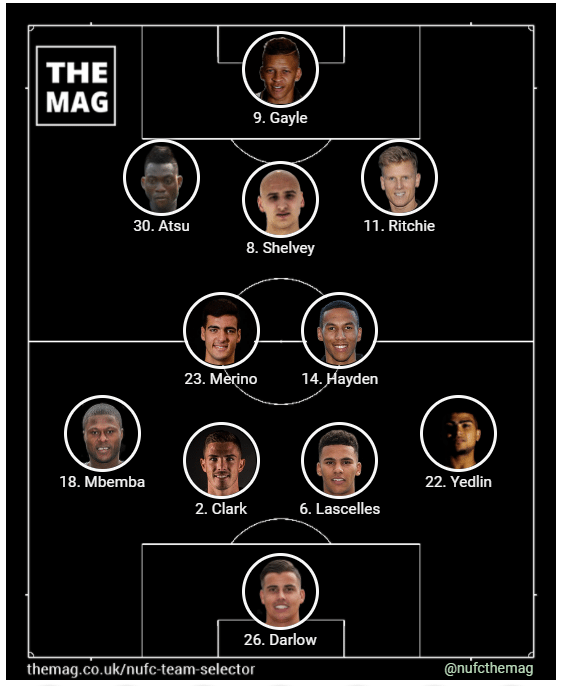 This is the predicted Newcastle team v Leicester for Saturday teatime’s match. Rafa Benitez confirmed on Friday that Christian Atsu and Jamaal Lascelles were now fit enough to return to the squad today. Paul Dummett won’t be involved though, after four months out he was given time on the pitch for the reserves in their win over West Brom on Friday night. I fancy Rafa Benitez to make five changes today and go for what, at least on paper, looks to be his best team. If fit enough then Lascelles must surely come straight back in after training the past four days – 12 goals conceded in the last four matches when he hasn’t started. Florian Lejeune has struggled a little bit and probably needs taking out of the firing line, thus reuniting last season’s first choice centre-back pairing of Clark and Lascelles. Dummett’s absence must surely ensure Chancel Mbemba goes back to left-back after the Matt Ritchie wing-back experiment backfired at Chelsea. Meanwhile at right-back I think DeAndre Yedlin will get another chance at right-back, Manquillo looking weak at Chelsea, whilst Yedlin will be needed I fancy to help deal with a pacey Leicester side. Karl Darlow definitely deserving to stay in the team as one of Newcastle’s better players last Saturday. Mikel Merino will continue and alongside him I think we will see Isaac Hayden back in the team, Diame absolutely hopeless at Chelsea. Dwight Gayle is a sure starter with two goals against Man Utd and Chelsea in his last three games. Behind that sole striker, it will be interesting to see which three Rafa will pick. Matt Ritchie’s form has been up and down recently but will play, whilst despite Murphy having done ok, I see Atsu getting back in. Finally, the spot behind Dwight Gayle. Left on the bench recently, I think Jonjo Shelvey will get a chance as Rafa tries to keep the ball better and get control of that middle of the pitch. Playing an extra central midfielder can also allow Merino and Hayden to get forward more when given the opportunity.